The Sony Alpha SLT-A57 SLR Digital Camera (Body Only) combines the quality and control reminiscent of a professional DSLR and pairs it with the convenience and efficiency of a point and shoot camera. This melding of technologies allows you to make outstanding imagery with a simplistic interface and functionality. Featuring a 16.1MP APS-C Exmor HD CMOS sensor, this camera is able to capture high quality stills and video with excellent low-light sensitivity. It also features Translucent Mirror Technology for continuous AF monitoring, permitting you ensured sharpness when recording full HD 1080p video or photographing at up to 12 fps. This quickened performance carries over into a number of features that are designed specifically for capturing the best images possible without you having to be concerned over specific camera settings. Auto Portrait Framing is a unique mode that automatically recognizes portrait situations and creates balanced portraits based around the characteristics of your subject. It utilizes a number of other modes, including Face Detection, Smile Shutter, and Face Registration, and creates an appealing composition based on where your subject is located within the frame, where they are looking, and how they are being lit. Clear Image Zoom is also employed in Auto Portrait Framing, and is able to zoom the center of your image up to 2x with almost no noticeable image degradation. Reviewing and monitoring your imagery is also simplified due to an enhanced Tru-Finder EVF and a high resolution tiltable LCD monitor. The Tru-Finder viewfinder provides a range of helpful information within the display as well as the ability to preview the effects of exposure control, white balance modifications, and other creative modes. The LCD monitor measures 3.0" and features 921,600-dots for crisp imagery during playback or in Live View. It can also be tilted up to 180° and rotated up to 270° for use in a variety of directions. This camera is also bundled with a Sony 18-55mm f/3.5-5.6 DT AF zoom lens, providing you with a range of focal lengths for a large variety of situations. 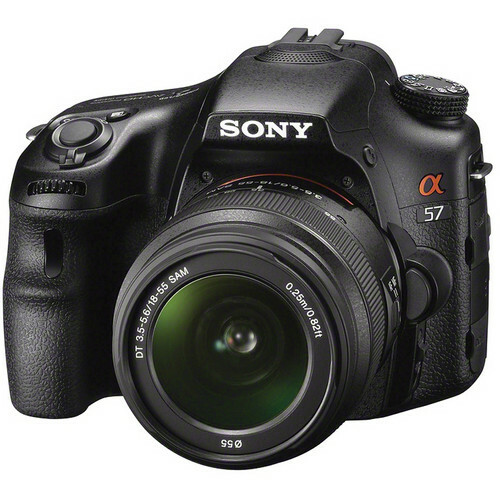 It features Sony's smooth autofocus motor for quiet operation, which is especially useful when recording video. Translucent Mirror Technology is the backbone of this camera and provides a stable platform for many of the high speed features to function from. This technology automatically directs light to both the image sensor and AF sensor on a full-time basis for quick, responsive actions. Utilizing the Translucent Mirror Technology, the autofocus system is able to continuously monitor the image frame and alter the autofocus quickly and responsively. This continuous focusing is especially useful when critical focus is required during video recording or when shooting in continuous modes. It uses 15 points, including 3 cross sensors for a great deal of accuracy and speed when determining focus points. This focusing efficiency is even highly capable under low-light situations and when used in conjunction with tracking moving subjects. When using the Tele-zoom Continuous Advance Priority AE mode, up to 12fps can be recorded while magnifying the center of your image by 1.46x. This cropping limits your image resolution to 8MP and brings your subjects closer for tighter compositions. When photographing in full resolution, up to 10fps can be recorded. The 16.1MP APS-C-sized Exmor HD CMOS sensor provides a high level of image quality and additional low-light sensitivity benefits. This sensor allows for an extended ISO range from 100 to 16000 while effectively reducing noise at higher sensitivities. This combination of sensitivity and reduced noise make this camera ideal for use for action photography indoors or at night. The enhanced BIONZ image processor utilizes complex algorithms to deliver fast speeds and performance, significantly reducing write times and generally quickening the entire process of using your camera. The increased power afforded by this processor also gives room to increased noise reduction and richly detailed gradations throughout the entire dynamic range. The Sony 18-55mm f/3.5-5.6 DT AF zoom lens is included with this camera, providing you with a range of focal lengths for a large variety of situations. It features Sony's smooth autofocus motor for quiet operation, which is especially useful when recording video. It is lightweight and compact, too, for excellent portability. Full HD 1080p recording is supported with this camera and also makes use of the high-speed Translucent Mirror Technology for continuous autofocus, even while using Live View to monitor your shooting. The AVCHD version 2.0 (Progressive) format is used and allows recording of 60 frames per second for outstanding clarity and motion detail. Additionally, the 24p frame rate is supported allowing you to create movies with a more cinematic feel. This slower rate is the same that is used in movie theater playback and gives an inherently cinematic look and feel to your movies. For even greater control over video recording, fully manual shooting modes allow you control over your aperture and shutter speed. Using By Pixel Super Resolution Technology, this camera is able to zoom the center of your image up to 2.0x with little to no perceivable image degradation. This complex system of algorithms virtually doubles your zooming range and provides a realistic opportunity to create compelling images from great distances. The Tru-Finder EVF is a high resolution finder featuring a 1,440K-dot resolution, a 100% field of view, and a wide 31.9° viewing angle. This finder displays pertinent image information regarding exposure settings and modes. Additionally, this finder has Shot Result Preview, giving you the ability to preview the effects of exposure control, white balance modifications, and other creative modes before making an exposure. It also features adjustable finder magnification giving you the choice between 1.04x and 0.97x, permitting you to see the entire frame while wearing glasses. The rear 3.0" / 7.6cm LCD features Sony's TruBlack technology for increased clarity and resistance to reflections. It has a 921,600-dot resolution for sharp, vivid imagery when reviewing images or monitoring your recording while using Live View. The monitor also features Shot Result Preview, for previewing the effects of your camera's settings before the exposure is made. For even greater viewing possibilities while shooting, the screen is able to tilt up to 180° vertically and rotate up to 270° horizontally. The range of movements and reflection protection give you a wide variety of possibilities for viewing from difficult angles and lighting conditions. This camera feature's Sony's SteadyShot technology for image stabilization within the camera. By reducing camera shake at the camera level you can achieve shake compensation up to 2.5-4.5 stops in shutter speed. This technology is compatible with any Sony Alpha lens. You can manually assign up to 24 different functions to 2 buttons for enhanced control over your own shooting needs. The AEL and ISO buttons can be modified to provide one-touch accessibility to modes such as Drive Mode and Flash Mode. Panoramic images are simple to create with this mode; simply pan your camera across the scene and the camera will automatically stitch together several images into one seamless panoramic file. 3D Sweep Panorama is also supported and functions with the same convenience, but automatically creates a stereoscopic image for 3D viewing on an HDMI-compliant 3D television. The built-in pop-up flash features a guide number of 32.8' / 10m at ISO 100 and covers the range of an 18mm wide angle lens. These modes all help to simplify the process of creating the best exposure possible, allowing you focus on what you are taking a picture of more than the camera settings. Superior Auto mode automatically detects the scene you are photographing and adjusts the camera settings accordingly to give ideal results. It also is capable of activating continuous shooting modes for moving subjects and Auto HDR mode if the dynamic range is beyond that of a single frame. Scene Selection affords you a bit more control and allows you to determine the type of scene you are photographing; the camera settings are then adjusted based on your decision. Exposure mode also allows you to select the type of image you are trying to create and then applies settings in-camera to compensate for the difficulties of that given situation. A variety of picture effects are supported for in-camera image-processing and creative applications. These effects include HDR Painting, Soft Focus, Miniature, Soft High-key, Pop Color, Partial Color (Red, Green, Blue, Yellow), Rich-tone Monochrome, Toy Camera, High Contrast Monochrome, Posterization (Color), Posterization (Black & White), and Retro Photo. Box Dimensions (LxWxH) 8.6 x 6.5 x 7.1"
Alpha SLT-A57 SLR Digital Camera with 18-55mm Lens is rated 4.6 out of 5 by 33. Rated 5 out of 5 by Skip from Excellent Camera I was pleasently surprised with this camera. I find the EVF to be extremely useful for being able to see the effects of my exposure compensation before I take the shot. The automatic HDR mode works extremely well and I had no trouble getting used to the menu which to me is well thought out and very intuitive. It seems to me that Sony has taken full advantage of the digital process by eliminating the mirror and it's effect on shooting speed. I took this to a local semi-pro football game and was amazed at it's shooting and focusing speed. This camera is suitable for both the advanced and the beginning photographer. Rated 5 out of 5 by garyandsusanna from The Best. A gift from my husband, this is my first DSLR camera, and I love how it works! It's easy to use, fast, and -- dare I say it -- very intelligent. It's just the right size, and wow, you get a lot of bang for the buck! Thank you Sony for coming out with another awesome camera. Rated 4 out of 5 by Amateur Videographer from Great balance of video and still quality I bought this camera because I was interested in jumping back into video production (I typically do things like promotional materials for non-profits) but also needed something that would do great with stills for pictures of family and friends. The Panasonic GH2 appeared to edge out the A57 on video at this price point but still photography was much better on the A57. The camera is very, very easy to use and slowing down 1080/60p is even more fun than I thought it would be. The stills are quite sharp and the 12fps continuous shooting mode is very impressive. I just ordered the Minolta 50mm f/1.7 lens to get better performance in low-light and think it will enable me to get much more out of the camera. The real bad thing about this camera for video is that the sound is dreadful and the microphone input is almost useless with automatic gain control. If you want to do anything serious at this price point you'll have to get an external audio source - I really wish Sony gave you more control over sound. Rated 5 out of 5 by Cea from Best performance under the SLT-A99 I upgraded to the A57 from the shorter bodied A35. I like the swivel screen, taller larger hand grip. It takes very good pictures for its class although anything over 800 ISO is going to be pretty grainy. With the a65 and a77 above it in the lineup, i think this is the most value of the three. the ones below it like the a37 are missing alot of features the above mentioned have for the little less it costs. The a57 is the same body as the a65 with just a couple little differences but most of these cameras till the a99 have the exact same aps-c size sensor therefore the higher megapixels dont mean a better picture but actually a potentially worse picture. the more pixels they try to cram into a sensor the lower the quality is. In a studio setting i can take terrific detailed photos at the lowest 4mp resolution on the a57 with studio wireless strobes combined with a 28-75mm F2.8 tameron lens as well as a 70-200mm f2.8 lens. the kit lens will get you started but its a poor lens with very little versatility. these camera accept a wide variety of older minolta lenses along with the modern Sony line and Tameron, Sigma etc.. the one bummer for these cameras up till the current a99 and the new a58 (which is a joke compared to the a57 )is they have a standard hotshoe connection vs. the minolta proprietary the line has had up till now. but for 10 bucks online you can get adapter to fix that. Rated 4 out of 5 by Sports Mom from Great camera I'm a beginner and this camera makes me look like an expert! The resulting pictures are great. The menu is easy to use. I only gave 4 stars because I really have no basis of comparison. Rated 4 out of 5 by FotoBloke from Sony Engineering vs the Bean counters I purchased this camera barely 2 weeks after I had purchased another brand, so the comparisons really did hit home. In my house we have three Sony TV's and they are all superb so after reading several very positive reviews on the A57 I purchased one with the 18-55mm lens. I was bitterly disappointed right out of the box that the bean counters had decided not to include a lens shade or a back cap for the lens. They probably saved all of a dollar on that. I did read the manual through but even after that I felt it was all a bit too much to learn. I was so disheartened I nearly returned the whole thing to B&H for refund but I kept remembering those great revues.. so I persevered.It gradually came to me that this is a brilliant camera which makes beautiful photographs. I'm not interested in movies so I can't comment on that but if you're a still photographer you really can't go wrong. I love the 'auto ISO' feature too which, at first, I had refused to use. It makes beautiful shots at high ISO's too.Now,if Sony can just unload a couple of bean counters.. we're in business. Great camera! I ordered the 55-200mm as well now. Rated 5 out of 5 by HalB from Great as expected This is my seventh in a long line of Sony still and video cameras and again, no disappointment. The contant focus is great. I need to find another rodeo to shoot! The color in the viewfinder is poor, but the stored image color is the best yet - no oversaturated reds as I've seen before. Now if I can find a vertical grip, I'm all set until the Alpha 2000? Rated 5 out of 5 by matizzy from Amazing Underrated Camera! This camera was really cheap and it performs as well if not better than cameras that cost more than it such as the cannon t4i. The kit lens if fairly good for everyday shooting. Additional lenses are cheaper than their counterparts from other companies because the camera has built in stabilization instead of the lenses having to have them.